I have yet another fun Christmas project to share with you today and as a part of Jo-Ann Fabrics’ Holiday Make it – Give it Sweepstakes you’ll have a chance to win a $100 Jo-Ann gift card! I’ll get into the sweepstakes details below, but first I’m so excited to share a little Nostalgic Noel. Jo-Ann Fabrics has compensated for this post, but as always all opinions are my own. When I was contacted about participating, my first nostalgic holiday thought was of nativity. 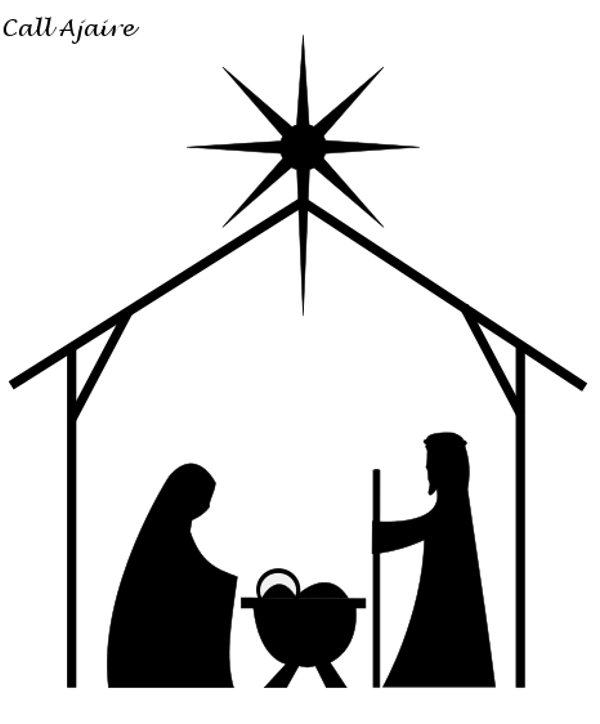 I realized our family didn’t have a nativity set yet – except the Little People one that Bean gets to play with – and though we have plans to get a nice one for next year, I wanted to make something that could act as a placeholder for this season. I also wanted to do some glass etching because it’d been ages since I’d done a glass etching project so I combined the two and made a nativity silhouette that could be etched in glass. 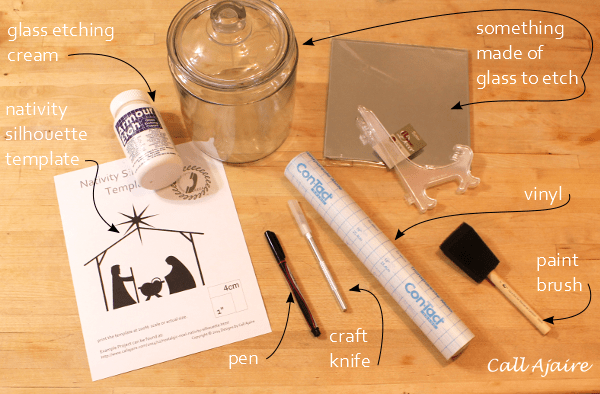 To make your own Nativity Silhouette Glass Etching, you’ll need to gather the supplies listed below. 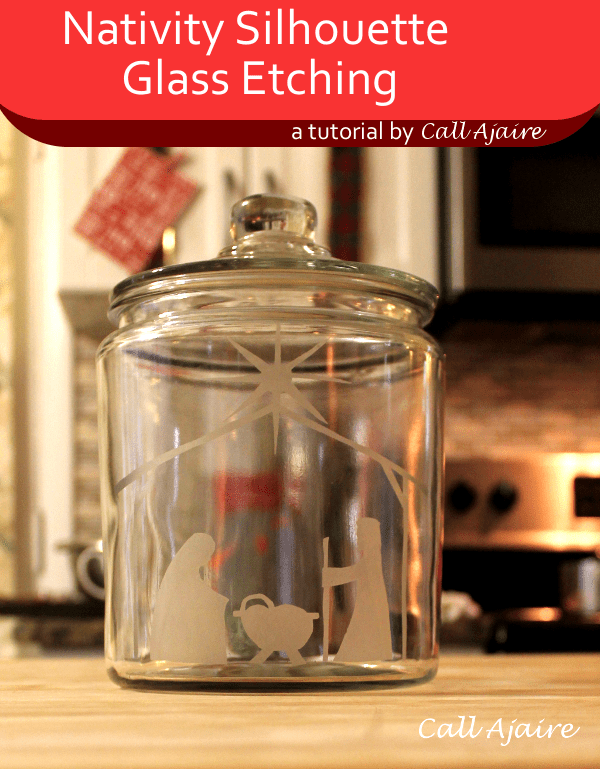 I used a glass cookie jar for my project since we were also in need of a place to store Christmas cookies, but Jo-Ann has a ton of other glassware including the square mirror you see in the picture above. I think the nativity silhouette etched on a mirror would make a nice mantel display. 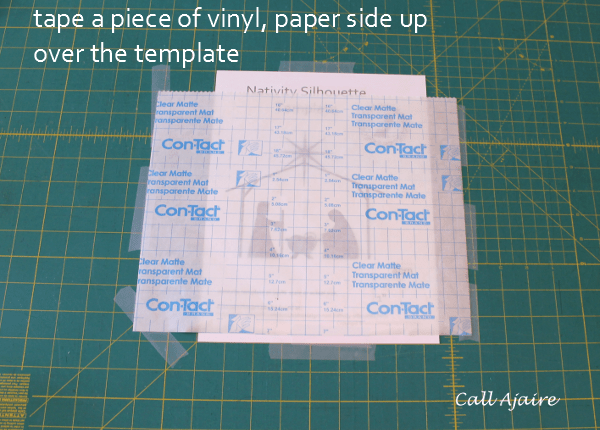 Start by printing out the template and taping it down to a self healing mat. You’ll notice that the template is printed in reverse so we can trace it on the paper side of the vinyl. 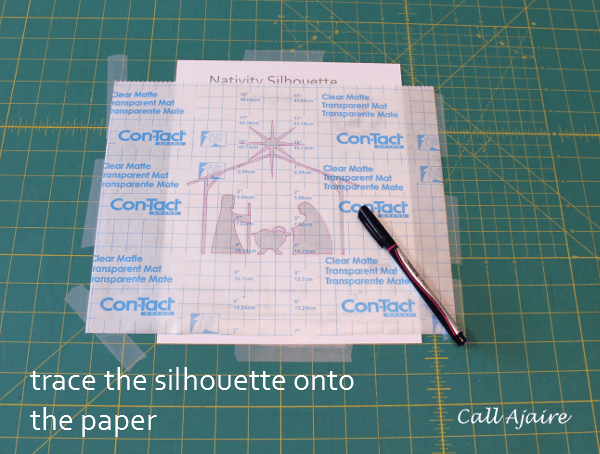 When the paper is later peeled away, the silhouette will be facing the correct way on the vinyl. For this particular design it probably doesn’t matter which direction is which, but it’s good to remember to mirror your vinyl cut out designs. 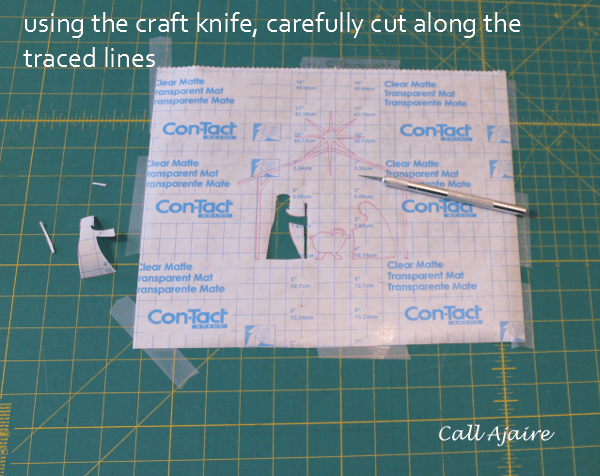 Tape a piece of the vinyl, paper side up over the template to prepare for tracing. Trace the design onto the paper side of the vinyl. Carefully cut out the design, remembering to save the small pieces of vinyl that are completely removed, like the triangle shape that forms the stable beam. 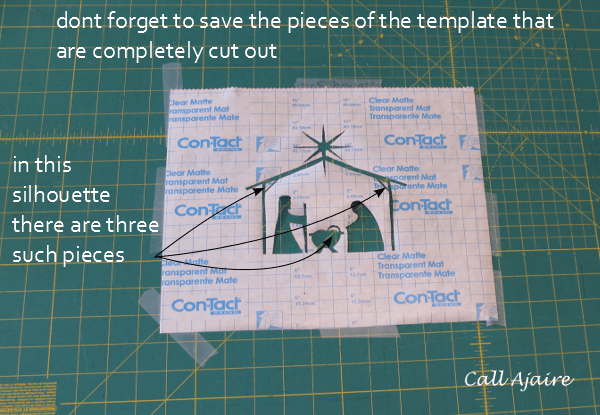 There are three small pieces to save: two triangles and the crescent that shapes the halo of the Baby Jesus. 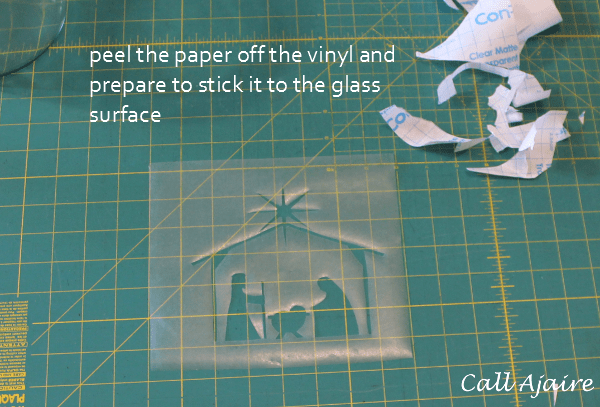 Peel the paper away from the vinyl and prepare to stick it to the glass surface. 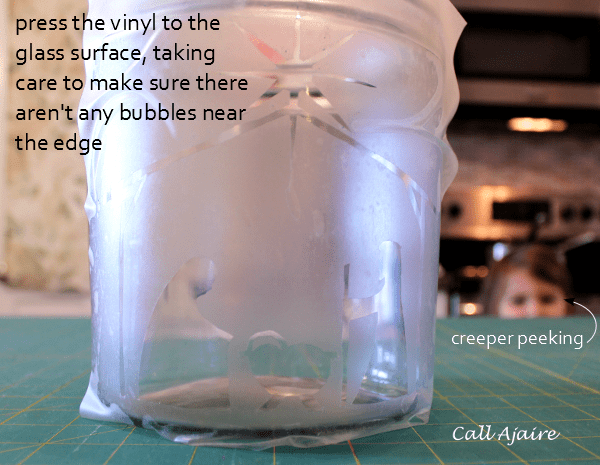 The cylindrical shape of the cookie jar made sticking the vinyl a little tricky, but the key is to make sure that any bubbles in the vinyl aren’t near the open edges. You don’t want any of the glass etching cream to leak under the vinyl. Using a bit of masking tape at the edges of the vinyl as extra protection helps. 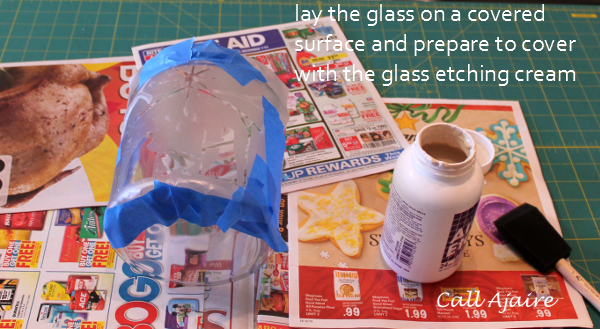 Cover your mat with newspaper and prepare to apply the etching cream. This stuff is super dangerous so please take every precaution. DO NOT GET IT ON YOUR SKIN. Paint a thick coating of the etching cream over the template and let it sit for five minutes. 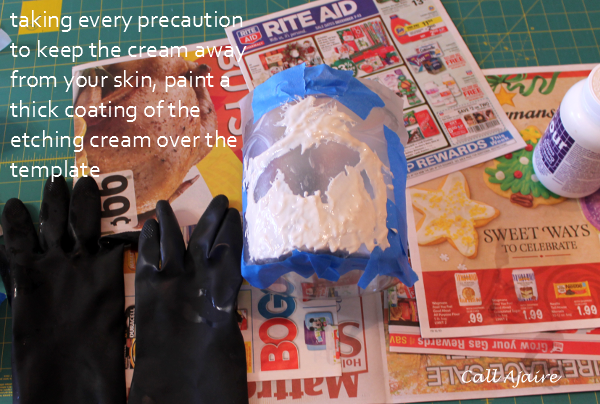 Once the five minutes is up, wash away the cream using plain water. Again, please be careful handling the etching cream. Wash the glass container, let it dry, and it’s finished! This project is really quick so there is still plenty of time to make one of your own before Christmas. With only five minutes of waiting time, I don’t know why I always forget about how cool glass etching can be! Now to enter the Holiday Make it – Give it Sweepstakes, just share a picture on Instagram of a holiday project you are working on and tag it with #MakeItGiveIt! You have until December 25, so start snapping those pictures. See official rules here and check out the featured entries on the Make Gifts Merrier Holiday Hub. 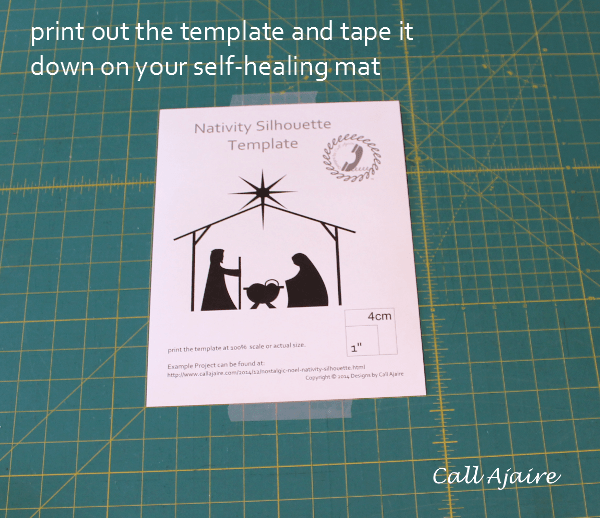 If you use my Nativity Silhouette Template I’d love you to share what you made in the Designs by Call Ajaire Facebook group too! This is beautiful, Ajaire. The girls did glass etching while they were in 4-H, but I have not thought about it in years. Another great way to make a special handmade gift as well. Thanks for the template. Thanks Donna! 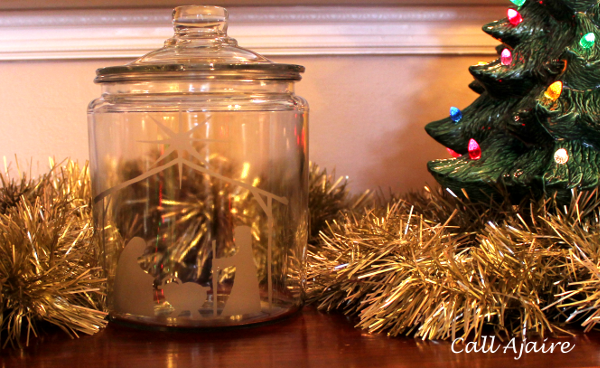 It's such a fun craft and with only 5 minutes wait time it's a great last minute gift! Glass etching is on my list for TSNEM! This turned out super cute!